This has been a tale from an alternate universe. In that world, Hillary did not win and Donald did not win. Disaffected liberals distanced themselves from Hillary after the Wiki-leaked emails told what her people did to Bernie. Disaffected Christians stuck to their guns over Trump’s immorality. It was like our universe, with a single difference. Leap’s non-candidacy had caught fire and provided an alternative which vast numbers accepted.. Things got out of hand. On November eighth, after a massive write-in campaign by people who surely didn’t really expect to succeed, Leap Alan Hed was voted in as the forty-fifth president of the United States. Oh, well. Could he be any worse? The people of his alternate universe may never know. Leap read the election results at a news stand and his heart all but stopped. Then he ran. It is said that anyone who wants to be President is automatically disqualified by reason of insanity. Maybe; if so Leap was the sanest man in America, because he really didn’t want it. He considered trying for asylum in another country. He thought about Switzerland, but he gets a nosebleed in an elevator. He thought about Russia, but the last thing he needed was to be caught up in that tug-of-war. He considered Great Britain, but he had once lived in California and the thought of all that rain dissuaded him. He decided to just disappear, and he did. I don’t know where he went; he didn’t tell me. Geraldo claimed to know, but that turned out to be a bluff. Somebody said they saw him heading north, following a compass, but everybody knows you can’t walk to the North Pole now that the ice caps have melted. He was probably looking for a Fortress of Solitude, and you can’t blame him. All those people who voted for Leap are now wringing their hands and wondering what is going to happen next. Every one of them thought they were the only one who would write him in. They never thought he would win. They certainly never thought he would run to Canada like a modern day draft dodger. Which, essentially, is what he is — drafted to be President, and scared out of his wits. Hillary has been very quiet about it all. She hopes to win in the House if they can find Leap and get him to resign. But it’s problematical. There are only fourteen Democrats and eleven Republicans in the new Congressional class. Aside from a few Libs and Greenies, the rest are all newly elected Independents, sent by a disgusted America. Bernie is smiling about that. Donald claims he will still win, and when he does, he plans to invade Canada to bring back that traitor Leap. I think he just might. Well have to leave their alternate universe now, worried sick and talking to each other about the kind of changes one man can make — even if he doesn’t want to. We have to get back to our own universe. We have problems of our own. This entry was posted in Serial and tagged Donald Trump, humor, Leap, literature, politics, writing on February 26, 2019 by sydlogsdon. This is the Apollo 9 LEM, photographed after it separated from its CSM. Photographs of either CSMs or LEMs in space are typically nose on, since each could only be photographed from the other (there wasn’t anyone else around to do it), and they only separated in lunar orbit at the outset of a landing maneuver or at rendezvous. Apollo 9 separated in low earth orbit and performed various maneuvers there, making this side-on view, right above the Earth, a rare treat. Apollo 9 launched fifty years ago March third. That’s a Sunday, and I don’t post on Sunday, but there will be plenty on that mission the following week. Virtually all of the missions returning from space have returned by atmospheric braking and parachute, or atmospheric braking followed by a winged landing. In the early days of science fiction movies, landings were always tail first but that was not possible on Earth until Elon Musk and SpaceX finally managed it in 2015. On the moon, there was no choice but to land tail first, slowed by rockets, and the LEM was built around that fact. Learning how to land tail first was also a major issue; see 185. The Flying Bedstead. The LEM was a two stage rocket. The descent stage, dot-shaded gray in this NASA drawing, made up about two thirds of the mass of the LEM. It contained a frame, tanks with fuel and oxidizer, a rocket engine, and the landing gear. It also contained storage space, accessed from the outside, for the equipment that would be used once the astronauts were on the moon. The landing gear served multiple functions. The pads at the end of each leg were designed to keep the LEM from sinking into the lunar soil. Their size was both a compromise and a guess. No one knew either how deep the lunar dust was, nor how much structural integrity it had. Worst case scenarios had the LEM sinking hopelessly into many feet of lunar dust, the accumulation of millions of years of micrometeorites pulverizing the lunar surface. In fact, the pads only sank slightly. The number of unknowns that faced the engineers and mission planners was immense. It it hard for people born since the seventies to imagine the depth of our ignorance before Apollo 11 landed. The struts were designed to absorb energy, because the LEM could not fire its engines all the way to the ground. The upwash of lunar dust and rocks would have blinded the pilot and possibly knocked holes in the LEM, so the engine was designed to be cut off at a certain height above the lunar surface, letting the LEM fall the last small distance. But how high? That was another calculated estimation (guess). And how much spring would the struts need? Too little and the LEM would crash to the ground. Too much, and it would rebound with possibly disastrous results. And if one leg landed on a boulder or in a hole, the whole LEM might tip over and be unable to return to orbit. The ascent stage contained crew space, controls, computer, radar, guidance systems, oxygen for human use, and the crew in their space suits. It also contained fuel and oxidizer and its own rocket engine, all smaller than for the descent stage since the LEM ascent stage was one third the size and mass of the complete LEM. The descent stage formed a launching platform for the ascent stage. When Apollo 17 launched from the moon, a camera was mounted on the rover which was left behind. You can see all 36 seconds of the last ascent stage liftoff from the moon at https://www.youtube.com/watch?v=9HQfauGJaTs. Apollo 11 proved that all this would work. Apollo 10 was a dress rehearsal of everything but the final landing. But until Apollo 9, fifty years ago this weekend, no one knew if the LEM would work at all. This entry was posted in A Writing Life and tagged americana, history, science fiction, space travel, spaceflight, writing on February 25, 2019 by sydlogsdon. It was late on November seventh. The sun had already set and with its passing, the chill of evening had set in hard. Leap Alan Hed — calling himself Joe and hoping that none of his homeless companions around the fire would recognize him — pulled his coat closer around his shoulders and stretched his hands out to the warmth. It was a vain hope. The press had hounded him out of his home in Dannebrog, and hounded him half way across America and back again. His picture had been spread across the country in countless newspapers and television broadcasts. Leap gave up the masquerade. He said, “I don’t know. They won’t vote for me. They aren’t that stupid, no matter how frustrated they have become. They will vote for Hillary and God knows what that will mean. Or they will vote for Donald, and everybody knows what that will mean. “Its going to be Donald or Hillary or you,” the other said. This entry was posted in Serial and tagged Donald Trump, humor, Leap, literature, politics, writing on February 25, 2019 by sydlogsdon. This is the Apollo 9 LEM, photographed after it separated from its CSM. NASA photograph. This was originally intended as a detailed picture of the Lunar Excursion Module, but it became clear while writing that before I could talk about the vehicle, I had to lay out it’s place in the scheme of things. This post then became a generic mission profile, and details of how the LEM worked will come in the next post. If you Google lunar lander, you will find the LEM, but you will also find a lot of forgotten craft. Both the United States and the Russians had unmanned lunar landers and lunar crashers. That’s not a joke. Before soft landing was perfected, we learned a lot about the moon from probes which photographed all the way down to a crash landing. Those piles of rubble that dot the moon were the ancestors of Spirit and Opportunity. That’s not good enough for a craft that was to be, in the vernacular of the day, man rated. The LEM, or LM as it is often called today, was unlike any manned craft before or since. 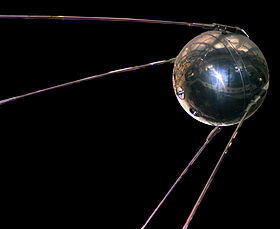 It has been called a “true” spacecraft, but in fact it only got half way toward that ideal. A “true” spacecraft, built in space and powered by a low force, long acting engine, would never have to endure the vicissitudes of atmospheric friction or high gravity. The LEM did have to withstand multiple gravities during its launch from Earth, and again on landing and taking off from the moon. However, it never had to come in contact with atmospheric friction because it spent the launch hidden behind a streamlined clamshell shroud. It didn’t itself have to be streamlined, and its skin could be flimsy. The astronauts joked about being afraid of accidentally putting a boot through the side of the vessel. At least I think it was a joke. The Saturn 5 is called a three stage rocket. It could as easily and accurately be called a six stage rocket. The first and second stages were designed to burn all their fuel and fall away. The third stage carried the rest of the vehicle into orbit and then shut down; at that point, it’s fuel was not exhausted. If the mission was to lunar orbit or landing, the Apollo craft stayed in low earth orbit long enough to establish that all was well, then the third stage fired again to send the craft toward the moon. On Apollo 8, there was no LEM, so in December I only described the Saturn and the CSM. Apollo 9, whose fiftieth anniversary comes in about ten days, had a LEM but never left near Earth orbit. Apollos 10 through 17 were lunar missions. They had similar flight plans and used all “six” stages. When the Saturn third stage fired a second time, it put the entire remaining craft into a orbit toward the moon. The third stage would have gone right along with the rest to the craft, if it had been allowed to do so. What happened next on each mission was well presented in the movie Apollo 13, but only if you already knew the what, the when, and the why. It was drama, not documentary, but with excellent animation. If you have a DVD of Apollo 13, take a look. The LEM, and the CSM (command and service modules, treated as one) had initially been stacked vertically above the third stage, with the LEM protected by a shroud. The attached NASA drawing also shows the abort rocket above the command module, but that had already been discarded by the time the craft was actually on its way to the moon. All three astronauts were in the CM. The CSM, the LEM, the shroud, and the third stage are all still in one piece. Now the CSM was released; it moved forward on maneuvering thrusters and turned a one-eighty. The LEM was still attached to the third stage. Now the clamshell opened up and the CSM moved carefully forward and docked with the LEM, front of CSM to top of LEM. The LEM was released from the third stage and towed away by the CSM. This position allowed the hatches on the CSM and LEM to mate so the astronauts could move freely between the two craft. The legs of the LEM, previously tucked under to fit within the shroud, now extended into lunar landing positions. From this moment until lunar orbit was achieved and it was time for the LEM to move away from the CSM and land (or nearly land in the case of Apollo 10), the LEM/CSM were essentially one space craft. The Saturn third stage now made one last burn, changing to an orbit that would carry it out of the way. For about two and one half days, the LEM/CSM drifted toward the moon. Upon leaving low Earth orbit, the craft had been traveling at close to 25,000 miles per hour. It should have reached the moon in ten hours, but the Earth’s gravity was pulling at it and slowing it down. Approximately six sevenths of the way to the moon, the craft was traveling at it’s slowest speed. At this point the Earth’s gravity and the moon’s gravity were in equipoise; thereafter the moon’s gravity accelerated the craft again. At a point on the back side of the moon, the SM engine fired, slowing the combined craft enough to keep it from whipping around the moon and returning to Earth. It entered orbit of the moon. This burn, and the later one which put the CSM on its homeward trajectory, make the CSM essentially the fourth stage of the Apollo/Saturn mission. Now it was time for the LEM to earn its keep. What’s that you ask? Stages five and six? Where were they? The LEM itself was a two stage rocket. We’ll get details on that next post. This entry was posted in A Writing Life and tagged americana, history, science fiction, space travel, spaceflight, writing on February 20, 2019 by sydlogsdon. Leap Alan Hed was going to Tulsa, to have it out with Billy Joe Barker. It had been eight weeks since he left his home in Dannebrog, running from the media circus that Barker had set in motion by calling on Americans to write in Leap’s name for President. Barker had started it all; Leap figured Barker owed it to him to at least try to stop it. It was hard for Leap to travel. He could go by bus, slumped down, face covered by the brim of his hat, and take his chances on being recognized. That was how he got to Hays, Kansas. There he picked up a ride with a friend of a friend from Dannebrog who took him as far as northern Oklahoma. He found himself stranded in Ochelata on a Sunday morning. By now Leap was hungry for normalcy, and on Sunday morning, that meant church. He couldn’t go in, of course. If you are from the city, or the north, you may not know this, but when you go into a small town southern church as a visitor, everyone in the congregation will come up and shake your hand, ask you your name, welcome you to their fellowship, and half of them will invite you for Sunday dinner. Leap would have loved that, but since his face had been in every newspaper in America . . . The Ochelata Baptist Church was a long, low green roofed building, built around a courtyard. There was a park on the east, so that was the direction Leap used for his approach. He walked in, as bold as if he belonged there, across the park to the blind back of the sanctuary where he settled down hidden by a few trash cans and sat for two hours listening to the service taking place on the other side of the wall. From time to time, his eyes were awash with the moisture of homesickness. He slept the day out in a wooded ravine, and walked southward on Highway 75 during the night. Morning found him somewhere, but he didn’t know where, hungry, cold, and discouraged. He was in front of a convenience store, on the outskirts of a small town, so he pulled up the hood of his sweatshirt and went in. He kept his eyes floorward as he picked out a couple of donuts and a cup of coffee, and didn’t look up at the checkout where the surveillance cameras are clustered. Outside again, he found a bench at the edge of the light. He was on his second donut when a pickup rolled to a stop. A man of fifty got out and exchanged a few parting words with his driver before she u-turned and disappeared. Everything about their casual friendliness said man and wife. He was carrying a brown paper bag that said “lunch”. He crossed to Leap’s bench and sat down. He glanced at Leap, looked away, then his head snapped back again. He studied Leap for about five seconds, then turned his head back toward the road and didn’t look again. Leap’s bench mate said was waiting for a bus that would take him west to Sperry where he had a job as a school custodian. And, yes, there was another bus that went south to Tulsa. After twenty years as a skilled lathe operator in a small factory, the man had lost his job after 2008. He had been out of work, except for odd jobs, for seven years, and now he was pushing a broom at age fifty, and glad to get the work. He had gone from Democrat, to Republican, then further with the rise of the Tea Party. He had no faith in government, no faith in politicians, but he still had faith in free enterprise. Where he had worked all his life, the owner had been just down the hall, working all day behind a second hand desk in a room with plywood walls. They had gone to the same church, and every decision the owner had made had included concern for his employees. The factory made small parts, that went onto larger parts, that then went onto automobiles. In 2008, the system collapsed and the factory folded. Leap’s temporary friend blamed free trade and Hillary and Obama. He did not blame large corporations and their CEOs. His vision of free enterprise was a hard working owner in a dusty plywood room, with forty hard working employees out on the floor making things. Multi-national corporations were outside his experience and outside his imagination. This entry was posted in Serial and tagged Donald Trump, humor, Leap, literature, politics, writing on February 20, 2019 by sydlogsdon.